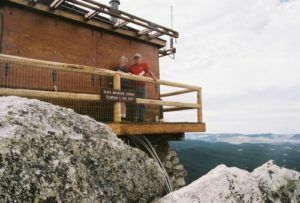 Moderate hike in the Big Horn Mountains to an old fire lookout and breathtaking views. The trailhead for this hike is a scenic 45-minute drive from Lazy R. Take US 14 west for 22 miles. Turn south on Forest Road 16. It will be marked. Go about 8 miles to Forest Road 222 on your left. If you have a high clearance vehicle, you can drive the mile to the trailhead. Otherwise, park here and hike one mile on the 4 wheel drive road to the trailhead. The trail travels an additional 2 miles up the mountain. At the top is a fire lookout. This is a moderate 3-4 hour, 6-mile hike with about 1500 ft. of elevation gain.